A documentary about the home health care revolution in Oregon, produced and directed by the University of Oregon’s Bob Bussel with Sonia De La Cruz, is premiering at Salem’s historic Grand Theater Jan. 25. “The Care Revolution: The Transformation of Home Health Care in Oregon,” compiles footage from 35 interviews to look at how Oregon’s home care workers have made themselves visible through the Service Employees International Union and state legislation. Bussel, a professor of history, and De La Cruz, a UO media studies doctoral alumna, began the project in 2014. The original interview footage they compiled was funded by the American Folk Life Center in the Library of Congress, Bussel said. All 35 of the original, uncut interviews can be found online at the Library of Congress website. However, after looking at the footage, De la Cruz and Bussel decided the home care revolution was a larger story that needed to be told. The documentary received funding from the UO Office of the Vice Provost for Academic Affairs, the SEIU, the Labor Education and Research Center and Kaiser Permanente. 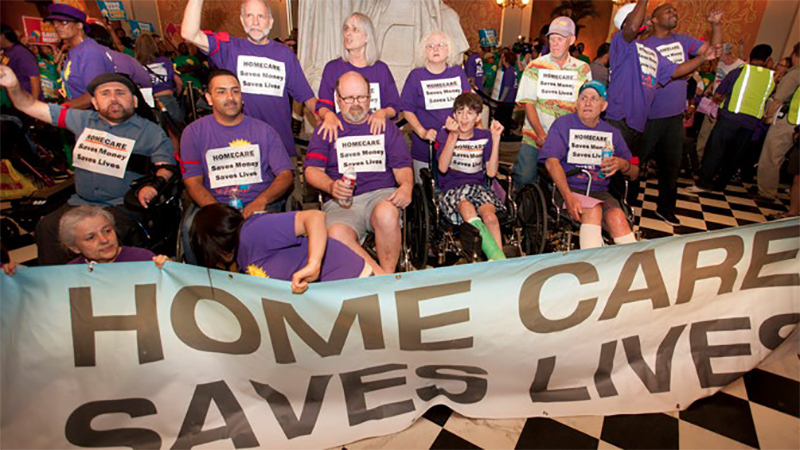 “Invisible no more” is one of the slogans of the home health care workers union. Previously, home care workers received little funding, no training and minimal recognition, Bussel said. However, he said that in the past 30 years home care workers in Oregon have emerged from the home, gained statewide recognition and greatly improved their own lives as well as their client’s lives. The 28-minute film also can be viewed on the UO Labor Education and Research Center website. Bussel hopes to disseminate the film as far as possible in order foster the growing recognition and funding of home care workers across the country. After the film, a panel including Bussel, De La Cruz and others involved in it will answer questions from the audience. The premier is free and sponsored by the SEIU Local 503 as well as the UO Labor Education and Research Center. Doors open at 7 p.m. Jan. 25, followed by show time at 7:30 p.m. Attendees can reserve their spots online.